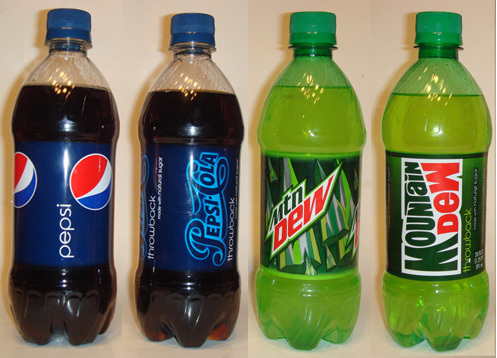 I was excited to hear a couple of months ago that Pepsi and Mountain Dew were coming out this summer with “Throwback” versions which contain cane sugar instead of high-fructose corn syrup. Not that I even like Mountain Dew but of course I just had to try both versions and see if there were any noticeable differences. Surprisingly, there was not too much of a difference. Ethan and I could tell there was no “syrupyness” to it and we did like that there was a little bit of what I’d describe as a “snap” to it. It seemed to taste cleaner in a way and I think throwback was a great idea, but in the end we both felt that the difference in taste probably wasn’t enough for them to continue production of this after the summer. As I mentioned I’m not a big “dew” fan. I won’t get too much into the review since we’ve already done it but feel free to check out the Mello Yello vs Mountain Dew post. Ethan being the former Mountain Dew drinker said he did like how citrusy this is and although it does taste very artificial, he said it was in a “good way”. This is just too much for me to take more than a couple of sips of. Too sweet and I don’t like drinking things that look like anti-freeze. I’d like to say that we were wowed by the throwback versions of both of these but we weren’t. While I did like the “crispness” of Pepsi throwback, it wasn’t the awesome experience I was expecting. Ethan was surprised that he preferred the modern Mountain Dew (or “Mtn Dew” as they now call it) over the throwback version for it’s more citrusy flavor and substantial consistency. If I had to buy one, it would be Dew throwback, I’d dump it out and just walk around with the bottle with the cool label. One other thing of note: the current version of Mountain Dew has orange juice listed as one of its ingredients. The throwback version doesn’t contain any kind of juice. I was surprised it wasn’t the other way around. I recently tried the Pepsi throwback & it seemed to have a taste that both me & my boyfriend described as “diet-y”. I’m not a huge Pepsi fan, but I really love the Mountain Dew throwback. It seems mellower. i’m not a Pepsi fan. 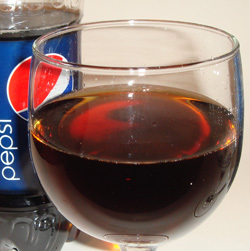 to be quite frank, i HATE the modern recipe for Pepsi. we bought Pepsi Throwback, and i’m in love. NOW i remember why my dad used to drink pepsi all the time. if Coke made a widespread release of their Kosher recipe (which uses real sugar) they’d make a killing. I am an avid Mountain Dew drinker. I absolutely detest the Dew Throwback. It tasted more like carbonated water, heavy on the carbonation. I couldn’t even get past that. I tried to like it, but there’s just no way. The Mountain Dew Throwback is good. As Grace says, it definitely has a smooth “mellow” taste as compared to modern Dew. I’m a Diet Dew drinker myself, so the full-calorie Throwback won’t be something I buy again, but I’m glad we tried. Have you had a chance to try Pepsi Natural? It’d make a nice follow-up comparison. It’s certainly got a distinct flavor. 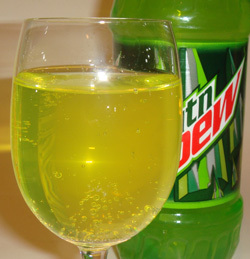 I find it interesting to hear that the US mountain dew tastes like lemon. The mountain dew in Aus doesn’t really taste like any fruit but just a sweet taste. I’ve also felt it tastes like sugar and water, but nothing in particular. I’ll have to go get a US mountain dew some day!! I’d say the current Mountain Dew flavor is more of a “generic citrussy” flavor, than a lemon flavor. The throwback version did taste more lemony to me though. To me the Mountain Dew Throwback tasted kind of like 7Up. I did like the Pepsi Throwback, though. I love Pepsi Throwback. When I was younger I drank Pepsi and liked it but then one day I starting hating it because it was too sweet. Pepsi Throwback is exactly how I remember “good” Pepsi – I hope they keep making it because then I would switch to being a Pepsi girl again and drop Coke like a bad habit. I really like Pepsi Throwback, and I’m not a Pepsi drinker. 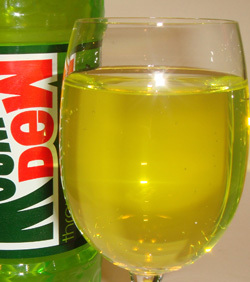 The Mountain Dew throwback tastes like a diet drink to me, but I don’t like regular Mountain Dew either. It is amazing how many products are going retro at the minute.. certainly here in the UK most adverts seemed to be the ones from the 1980s. I’m quite angry they are getting rid of the Pepsi Throwback. I haven’t been able to drink Pepsi normally for a long time since I got my gallbladder out. The high fructose corn syrup in Pepsi makes me sick to my stomach and if you pay attention, the stuff also causes diarrhea. Sad but true in my case. I can’t enjoy fountain drinks like I used to anymore without getting sick. The natural sugar and removal of the corn syrup in the Pepsi Throwback tasted so much better and like an older version of Pepsi. I’m going to miss it, because not once did I get sick and I was able to enjoy at least a full bottle. I can’t drink too many because then I’ll get on a huge sugar high, but it’s classic. That’s why it wins, and it’s sensitive on the stomach. I like both of the throwbacks, but the Mountain Dew Throwback has an edge over the Pepsi Throwback.. I think the Mountain Dew Throwback is more like the original flavor. I can’t stand the regular Mountain Dew with HFCS.. I think I have bought more Mountain Dew Throwback then I have bought in the past twenty years.. The Pepsi and Mountain Dew with hfcs has a aftertaste to them. The natural sugar ones have more of a cripser taste to them.. I buy Coke at Sams Club that is made in Mexico and is made with cane sugar.. They are the best…. I guess I will have to go back to buying them. 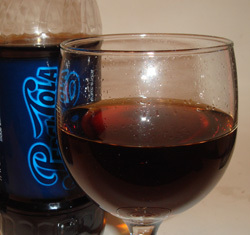 Back in the day; Coke was sweet and Pepsi was refreshing, no aftertaste like Coke. I actually preferred RC Cola as a youngster. Mountain Dew was sort of a weak after thought to Squirt. Squirt was real tart and made you pucker at first taste. Holy crap, who ever thought about throwback? They brought back throwback this winter and now their using it on Dr. Pepper too! Backing up my “Holy Crap, who ever thought about throwback” comment, I did not notice the bad iced tea taste,Ethan. That being said,I think getting Mtn.Dew Throwback as a prize for something or another was what started my still running Mtn.Dew addiction. Other than that,when they brought back Throwback I noticed that they used the “original” Mountain Dew logo,the “original” Dr.Pepper logo,and the “original” Pepsi Globe. I got completely addicted to Pepsi Throwback last summer and was bummed when my stockpile ran out and I had to go back to regular. If they bring it back this summer I’ll be investing my life savings into a large stockpile.